Online casino information site CasinoListings.com has published a comprehensive database listing the value and return to player percentages of 75 different casino games tied in to progressive jackpots. Assembled in cooperation with the Wizard of Odds Michael Shackleford, the database is both extensive and analytical in nature and took an extensive amount of work to calculate. The page breaks down a variety of casino games, including Caribbean Poker, Video Poker, Let’em Ride, Blackjack, Keno, Baccarat, Hi-Lo, and a variety of parlour games. The games themselves can be broken down by game’s current jackpot value, break-even dollar amount, return to player percentage (RTP), and chances of winning the progressive jackpot tied to the game. A break-even point exceeding 100% presents a situation where the casino offering the game no longer has an advantage over the player, and punters have the upper hand. The player making the proper bet tied to the progressive jackpot can then expect to come out ahead in the long run. This particularly applies to games with a jackpot side bet in the table published by Casino Listings. An interesting aspect of the collection of jackpot values is that certain games give a specific change to RTP percentages according to the currency in which you play the game. This is due to exchange rates, and some games have minimum wagers of $0.25 / €0.25 / £0.25, so players who play in US dollars are actually getting a better value than those playing in Euros or British Pounds. This means that the RTP percentages for Dollar players is higher, and players given the option should maximize the odds. The worst game in terms of current value is the OpenBet Caribbean Stud Poker game, which is available for play at Sky Vegas. The game has a current jackpot value of £41,247, which is much less than the game’s break-even value of £341,968 giving the game a break-even value of a paltry 12.1%. 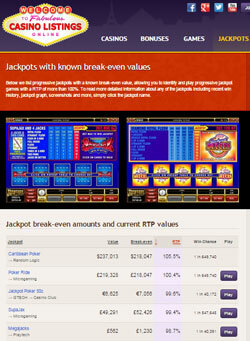 The break-even values for the game are the latest addition to the Casino Listings jackpot tracker, which has helped define the site as being one of the most reputable sources for online casino jackpot news and information. To date, Casino Listings tracks 609 jackpots, with 93,276 wins having been recorded to date worth $1,367,510,308. Casino Listings is an online betting information site that launched in 2007 and offers its visitors casino reviews, bonuses, news, jackpot trackers, free casino games, and an active forum community.